Bring a distinguished look to any decor with this selection of Live Ivy Topiary. Perfect for interior or exterior applications, this robust green ivy will lend visual appeal to any area. This variation of Live Topiary Plants boasts a maraud of large leaves with interesting design and color variation throughout. A perfect fit for many different settings and special occasions that require a hearty cascading Live Ivy Topiary. This type of vine is a fast growing variety with large leaves that somewhat take the shapes of hearts. This type of Fresh Topiary is commonly found on the bookshelves of distinguished dens and libraries. The Live Ivy Topiary is potted in an attractive plastic container that boasts a bright green bottom which fades to white at the top of the vessel. Adding to the beauty of this Live Ivy Topiary is the beautifully crafted bow that adorns the front of the pot. The removable bow is hand constructed from a wire lined ribbon that is fashioned into a six loop bow to add a pop of additional color and interest. Introducing this Live Ivy Topiary to your room or outdoor area is a great way to bring some natural elements into a design plan. These 8" tall Live Topiary Plants can be trained and pruned to follow forms or they can be left to grow long and free in their 4 inch pot. The possibilities are only limited to your imagination. This Live Ivy Topiary requires the brightness of the sun, but not directly. Watering a Live Ivy Topiary requires a balance between wet and dry. The soil must remain moderately moist but not retain enough water that the roots are subject to drowning. It is important to rid the pot of excess water and allow the soil to dry moderately between waterings. It is just as important to make sure that the Fresh Topiary is receiving enough water. Live Ivy Topiary plants that are kept indoors, hanging, or in elevated locations are subject to drying out do to the characteristics of heat rising in a room. 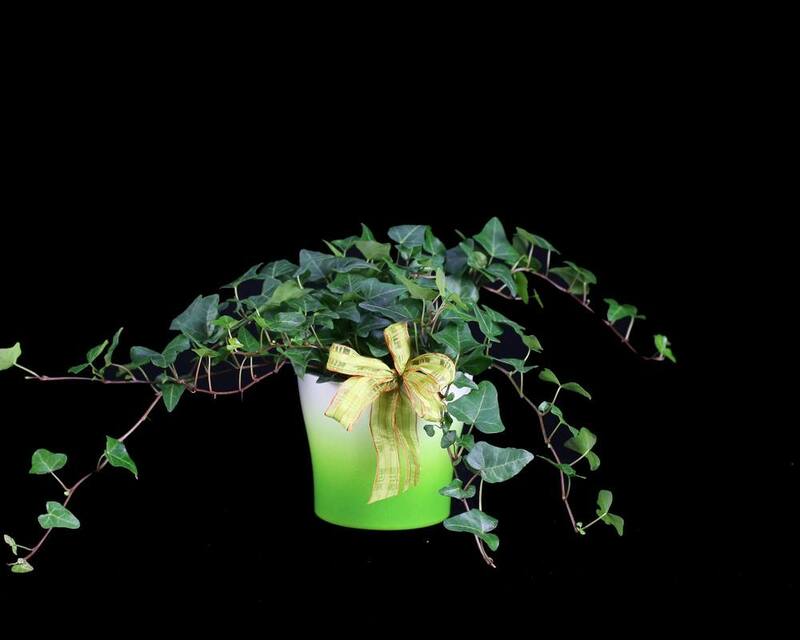 When purchasing this variation of Live Ivy Topiary, consumers are also able to choose to have their plant delivered in a Terracotta pot instead of the plastic pot that is standard. Either of these options can then be put in a protective Mylar wrap for added beauty and leakage prevention after watering. The lightness of this Live Ivy Topiary makes this variety a perfect option for sending to others as a gift, a thank you, or just because. Adding one of these beautiful and distinguished looking Live Ivy Topiary plants in your home decor is a quick and easy way to make a great impact. Naturally beautiful and hearty, this variation of a Live Ivy Topiary is the perfect addition to any space.